"It's a party in the sky" with the cast of The LEGO Movie. Airline safety videos are a necessary component of any pre-flight routine, but they're rarely very entertaining. That is, unless they happen to star the irresistibly amusing cast of The LEGO Movie franchise. To help bring a little joy to travelers, Turkish Airlines and LEGO have teamed up to produce an instructional pre-flight safety demonstration that is so ridiculously fun and catchy that it can only be described as one word: awesome. The clip features appearances by a colorful ensemble of LEGO characters, including Emmet (Chris Pratt), Wyldstyle (Elizabeth Banks), Batman (Will Arnett), Robin (Michael Cena), Joker (Zach Galifianakis), Lloyd Garmadon (Dave Franco), Princess Unikitty (Alison Brie), Superman, Wonder Woman, Green Lantern, the Flash, Benny the astronaut, Metalbeard the pirate, and more. Check out the Turkish Airlines safety video below! 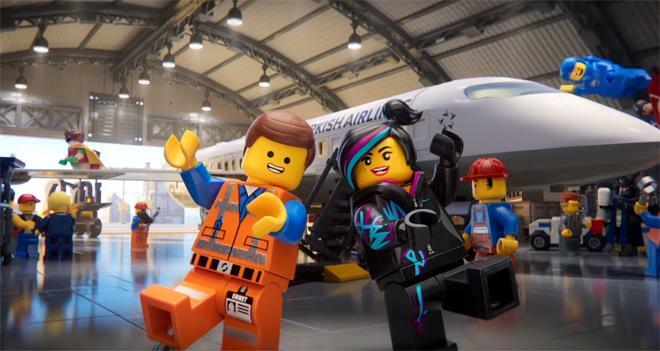 And beyond helping out with airline safety, the LEGO characters can be seen next on the big screen in Warner Bros. Pictures' The LEGO Movie 2: The Second Part. The film comes from director Mike Mitchell (Shrek Ever After, Trolls, Sky High) and is set to open nationwide in 2D and 3D on February 8, 2019. The much-anticipated sequel to the critically acclaimed, global box office phenomenon that started it all, The LEGO Movie 2: The Second Part, reunites the heroes of Bricksburg in an all new action-packed adventure to save their beloved city. It’s been five years since everything was awesome and the citizens are facing a huge new threat: LEGO DUPLO® invaders from outer space, wrecking everything faster than they can rebuild. The battle to defeat them and restore harmony to the LEGO universe will take Emmet, Lucy, Batman and their friends to faraway, unexplored worlds, including a strange galaxy where everything is a musical. It will test their courage, creativity and Master Building skills, and reveal just how special they really are.